Lenore Deans shared this photo with me last summer, and I’ve been saving it for the right season. 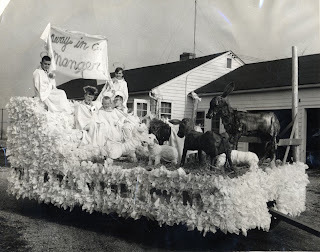 In 1955 the Aurora Branch participated in a downtown parade organized by Aurora churches to “Put Christ Back into Christmas.” Riding on the Aurora Branch entry, “Away in a Manger,” the angels holding the banner are Ed Kettley and Ginger Erekson [Hamer]. The other angels are John Resch, Erek Erekson, and Earl “Bucky” Spahr Jr.). Many churches were invited to enter floats and the Aurora Branch felt they had arrived as a congregation when they were asked to participate. Branch members spent many hours working on the float because they were eager to make a good impression. This photo shows that it was built at the home of Jim and Myrtle Greer (724 Foran Lane). Grandpa Greer’s hay wagon formed the base. The men added a high wooden platform with steps and the whole thing was covered with the obligatory chicken wire stuffed with Kleenexes. Cardboard letters on both sides spelled out “The cattle were lowing.” The name of the Church was displayed in similar letters on the back of the high platform. No one I’ve asked can remember how the float was pulled—Grandpa Greer’s tractor, a car, or pick-up truck. Lenore Deans made the cow, donkey and sheep from paper mache over wooden frameworks. When the float was dismantled, she kept the animals and displayed them in her living room at Christmastime for several years. We believe a photographer from the Aurora Beacon-News took this photo and it probably appeared in the paper, but more research is needed to find the exact date of the parade. We believe, of course, that it took place in December, even though the weather in the photo seems to be quite mild. If anyone has something to add about the float and the parade and/or corrections to the memories we’ve cobbled together here, please add a comment or email me.